Aesteiron Steel Pipes has pride in providing a whole range of high-class, customizable and innovative ASTM A335 P11 Alloy steel Seamless Pipes using state-of-art technology. Our range includes ASTM A335 P11 Alloy steel Seamless Pipes, Stainless Steel Seamless pipes & Tubes, Carbon Steel Seamless Pipes & Tubes and Alloy Steel Seamless Pipes & Tubes. For more than five decades, Aesteiron Steel Pipes has been serving the needs of the oil and gas industries, automotive, shipbuilding, power plants. All the supply records for most of the severe environment of ASTM A335 P11 Alloy steel Seamless Pipes & pipe line indicate that Aesteiron Steel Pipes is the leader in line pipe technologies. We have been supplying high quality ASTM A335 P11 Alloy steel Seamless Pipes with most advance technology and with most reliable quality. We will deliver quality, cost-effective ASTM A335 P11 Alloy steel Seamless Pipes that meet your specifications. We will work with you to make sure you get what you need, when you need it. We will provide you with the best customer service possible. We will keep our equipment updated and maintained. 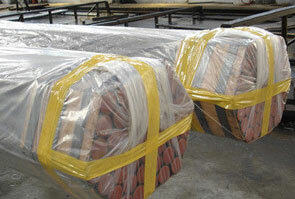 We will use the highest quality materials. 1/8″ ≤ NPS ≤ 2 1/2″ , All T/D ratios. This specification covers seamless ferritic alloy-steel pipe for high-temperature service. The pipe shall be suitable for bending, flanging (vanstoning), and similar forming operations, and for fusion welding. 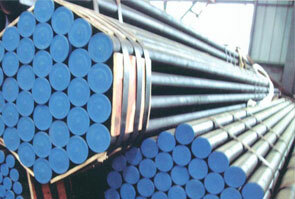 Grade P2 and P12 steel pipes shall be made by coarse-grain melting practice. The steel material shall conform to chemical composition, tensile property, and hardness requirements. Each length of pipe shall be subjected to the hydrostatic test. Also, each pipe shall be examined by a non-destructive examination method in accordance to the required practices. The range of pipe sizes that may be examined by each method shall be subjected to the limitations in the scope of the respective practices. The different mechanical test requirements for pipes, namely, transverse or longitudinal tension test, flattening test, and hardness or bend test are presented. For material heat treated by the continuous process, tests shall be made on a sufficient number of pipe to constitute 5% of the lot, but in no case less than 2 pipe. P11 shall not have a hardness not exceeding 250 HB/265 HV [25HRC]. For pipe whose diameter exceeds NPS 25 and whose diameter to wall thickness ratio is 7.0 or less shall be subjected to the bend test instead of the flattening test. Other pipe whose diameter equals or exceeds NPS 10 may be given the bend test in place of the flattening test subject to the approval of the purchaser. The bend test specimens shall be bent at room temperature through 180 without cracking on the outside of the bent portion. 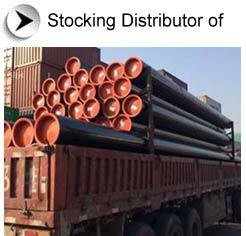 There are probably hundreds of different methods for packing a pipe, and most of them have merit, but there are two principles that are vital for any method to work prevent rusting and Sea transportation security. Our ASTM A335 P11 Alloy steel Seamless Pipes packing can meet any needs of the customers.